Ongoing investment in cancer control is a national priority. Cancer control is a national health priority area. Cancer is estimated to be the leading cause of the burden of disease in Australia in 2010, accounting for 19% of the total burden1. Cancer has a major impact on the Australian community. At current incidence rates, one in three men and one in four women in Australia will be diagnosed with cancer by the age of 75. By age 85, the risk increases to one in two for men and one in three for women1. A key challenge for action to control cancer is that the term encompasses a diverse group of several hundred diseases. All cancers are characterised by changes to some of the body’s cells which become abnormal and begin to multiply out of control. These abnormal cells can form an invasive (i.e. malignant) tumour. If the spread of these tumours is not controlled, they usually result in death2. Cancer is potentially one of the most preventable and treatable of today’s common causes of death. The effects of decisions made on cancer control strategies have long lead times. What is done currently will have its impact over the next 5-15 years; this timeframe is even longer for measures aimed at prevention rather than treatment. The impacts of cancer are not evenly distributed – the poorest areas and patients suffer the most. Research indicates that Australians living in lower socio-economic areas have higher mortality rates from cancers than those living in other areas 1. Similarly, people living in remote and very remote areas of Australia have higher mortality rates from cancer than those living in more urbanised areas. Indigenous Australians have higher mortality rates than non-Indigenous Australians1. The scientific evidence points to the significant growth in cancer incidence and makes meaningful planning to meet this challenge essential. 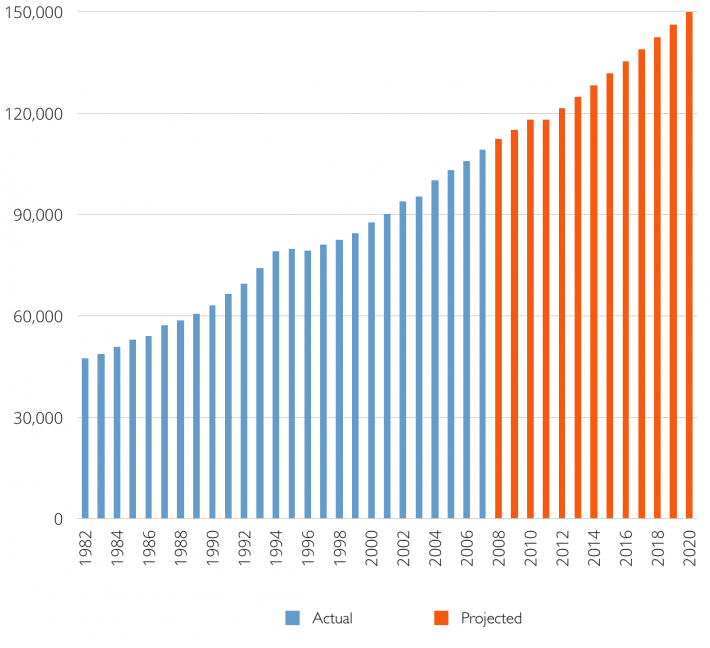 The Australian population has been increasing and is expected to exceed 25 million by 2020. The population is ageing as a result of sustained low fertility and increasing life expectancy3. In the next few decades, population ageing is projected to create significant fiscal pressures and to have major implications for health, labour force participation, housing and demand for skilled labour. Slower economic growth associated with ageing, increased demand for age-related payments and services, expected technological advancements in health and demand for higher quality health services will add to these pressures4. Australia has some of the best internationally recognised high quality data on cancer incidence through the work of the Australasian Association of Cancer Registries (AACR) and the Australian Institute of Health and Welfare (AIHW). This data provides essential baseline information and allows for projections of cancer incidence. These projections are a mathematical extrapolation of past trends and are illustrative of the future changes that might reasonably be expected to occur 5. Sources: Projected incidence5 historical incidence 6. The age related increase in cancer incidence across Australia is significant. The number of cases of cancer diagnosed in Australia will rise over the next decade for both males and females, and is expected to reach about 150,000 in 20205 — an increase of almost 40% from 2007.